Providing Professional Scales and Service to Businesses across the State of Texas. 24 Hour Repair and Maintenance Service Delivered by Highly Trained Technicians. Download Our ISO Certificate Here –ISO/IEC 17025:2005 Accreditation Certificate. Precision Calibration Services That Make Quality Control a Breeze! Keep Your Trucks on the Road doing what they do Best! Perfect for those who Need a Temporary Solution. Let Our Highly Skilled Technicians do what they do Best! Scale Solutions for any Type of Business Enterprise! When it comes to the scrap and recycling industries, strength, durability and accurate performance are key qualities to ensure long-lasting weighing equipment in demanding environments. North Texas Scales offers a broad selection of heavy-duty products ideal for material handling and scrap/recycling processing applications. From our rugged rail scales and tough truck scales, to our intuitive indicators/controllers, our products provide solutions to lower inefficiencies in scrap and recycling operations, and ultimately, lift profits. Logistic departments require durable equipment to simplify material handling processes, enhance shipping efficiency and maintain postal compliance. North Texas Scales offers the highest-quality and most cutting-edge weight-related and measurement tools for the logistics industry—all backed by legendary support. Our CLS cargo lift scale forklift attachment enhances efficiency in any shipping department and loading bay terminal. The CLS allows LTL freight material handlers to weigh pallets during the material handling process, saving time and money. CLS forklift scale attachments mount directly to any Class II or Class III forklift and are built with the utmost quality in product design. Used in conjunction with an dimension 400 LTL dimensioning system, the CLS provides logistic operators and managers accurate weight and dimensional data to ship pallets with confidence. The energy industry is tough work that needs scale equipment to stand up to the challenges of long-use, demanding materials and harsh conditions with uncompromising accuracy. From fracking and coal mining to natural gas, renewable energy and petroleum, North Texas Scales has developed a series of scale and process control products built tough for the heavy-duty and precise requirements in energy operations. The waste industry demands heavy-duty scale equipment built to survive long periods of service and harsh environments. From truck scales and on-board weighing systems to indicators/controllers and process control equipment, North Texas Scales offers several heavy-duty weighing products ideal for the waste industry. For waste hauling and transfer stations, our truck scales provide extreme durability and unbeatable accuracy. 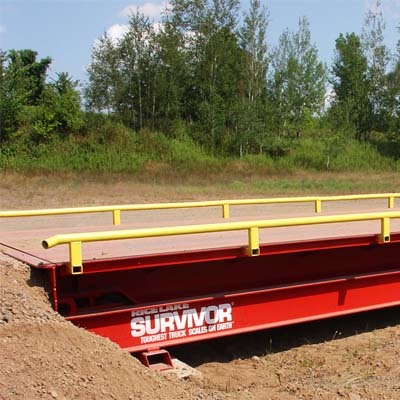 With 30% more steel than most competitive models, SURVIVOR truck scales are built tough from start to finish, ensuring utmost support for waste-hauling and weighing operations. Paired with automated ticketing systems and kiosks, vehicle throughput is increased and drivers stay in their cabs—enhancing safety for all. North Texas Scales (Scale Company) understands the importance of accuracy in the business and manufacturing world. As a full-service scale dealer, we service and install weighing equipment for hundreds of companies throughout the state of Texas. We are ISO/IEC 17025:2005 certified. Whether you need preventative maintenance or custom programming and system design, we focus on your individual needs. We offer an Industry Leading Maintenance Program designed to make maintenance and calibration a breeze. Quick, friendly responses no matter what the request has been. Quality service with kind professionalism. North Texas Scales is a company that I'd gladly use time and again.it. Professional, hard-working staff that always go the extra mile to be solution providers. Great company run by good solid people!